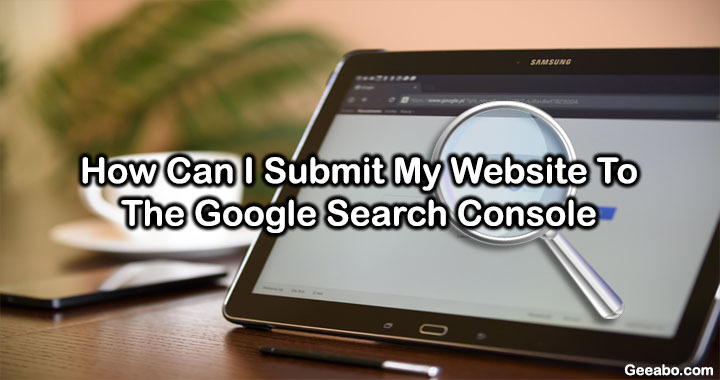 How Can I Submit Website To Google Search Console. Hey Guys, Are you also purchase a website and want to submit website to Google Search Console. But you are facing problem in submitting your website. Are you facing problem in verification? or anything else. Why We Submit Website To Google Search Console? As we all know that Google is the most usable search engine and every body wants to submit website to google, every body wants to rank in google because a very big traffic may come from google to your website. The only and most important reason to submit website to google search console is to rank and index our website in google quickly. Follow the steps carefully to submit your site to google. #Step 1. Open your browser and type “google webmaster tool” and hit on enter or simply Click Here. #Step 2. Now login to your Gmail account. #Step 3. Now you will come to the Welcome screen of the Google Search Console. #Step 4. Now simply type your domain name (Ex- https://www.geeabo.com) in the text field and click on “ADD A PROPERTY” button. #Step 5. After that you will come to this window. Here simply click on the second option that is “Alternate methods” and then click on the “HTML tag” radio button. and copy the mete tag given below. #Step 6. Now login to your WordPress admin account and go to “Appearance” and then click on “Editor” from the left side of the WordPress window. Now you you will come to the editor page. #Step 7 . After that scroll down and find “header.php or Theme Header” in editor window from the right side of the screen. #Step 8. Click on “Theme Header” and under <head> section paste the google meta tag. #Step 9. And then scroll down and click on “Update File”. #Step 10. Go to the Google search console tab scroll down tick the check box and click on “Verify”. After that you will see scree like this. Hope you like this article about How Can I Submit Website To Google Search Console and surely you have learn something new with the help of this article. Hope you like this article What is the Internet and you have learn something new with the help of this article. Please Do Like, Comment and Share if you really like this.